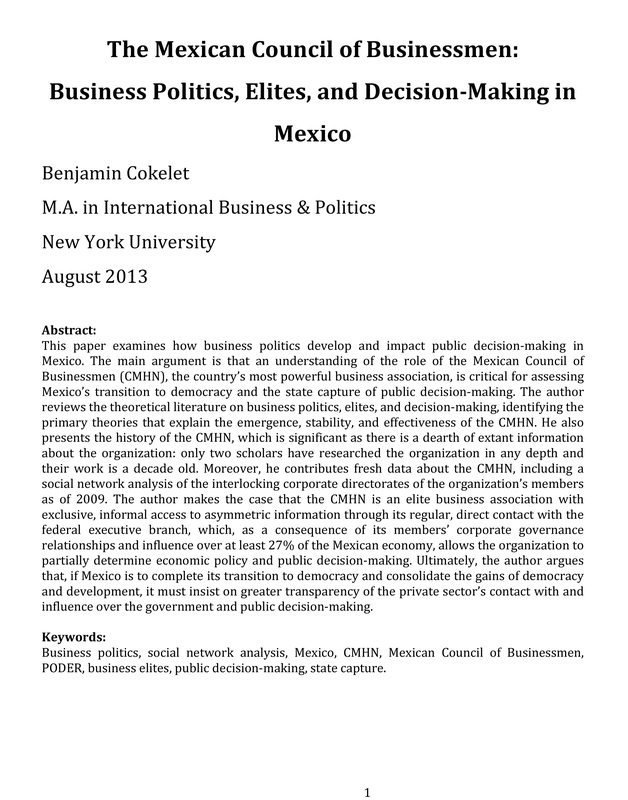 This paper examines how business politics develop and impact public decision-making in Mexico. The main argument is that an understanding of the role of the Mexican Council of Businessmen (CMHN), the country’s most powerful business association, is critical for assessing Mexico’s transition to democracy and the state capture of public decision-making. The author reviews the theoretical literature on business politics, elites, and decision‐making, identifying the primary theories that explain the emergence, stability, and effectiveness of the CMHN. He also presents the history of the CMHN, which is significant as there is a dearth of extant information about the organization: only two scholars have researched the organization in any depth and their work is a decade old. Moreover, he contributes fresh data about the CMHN, including a social network analysis of the interlocking corporate directorates of the organization’s members as of 2009. The author makes the case that the CMHN is an elite business association with exclusive, informal access to asymmetric information through its regular, direct contact with the federal executive branch, which, as a consequence of its members’ corporate governance relationships and influence over at least 27% of the Mexican economy, allows the organization to partially determine economic policy and public decision-making. Ultimately, the author argues that, if Mexico is to complete its transition to democracy and consolidate the gains of democracy and development, it must insist on greater transparency of the private sector’s contact with and influence over the government and public decision‐making.